Florida nursing homes have been cited for numerous deficiencies in the past 10 years. Nursing home residents have suffered from severe abuse and neglect as a result of deficiencies in nursing homes. In 2008, over 31 percent of Florida nursing homes used chemical restraints in an unlawful manner to restrain patients. In addition, 15 percent of residents in Florida nursing homes developed pressure sores as a result of neglect. 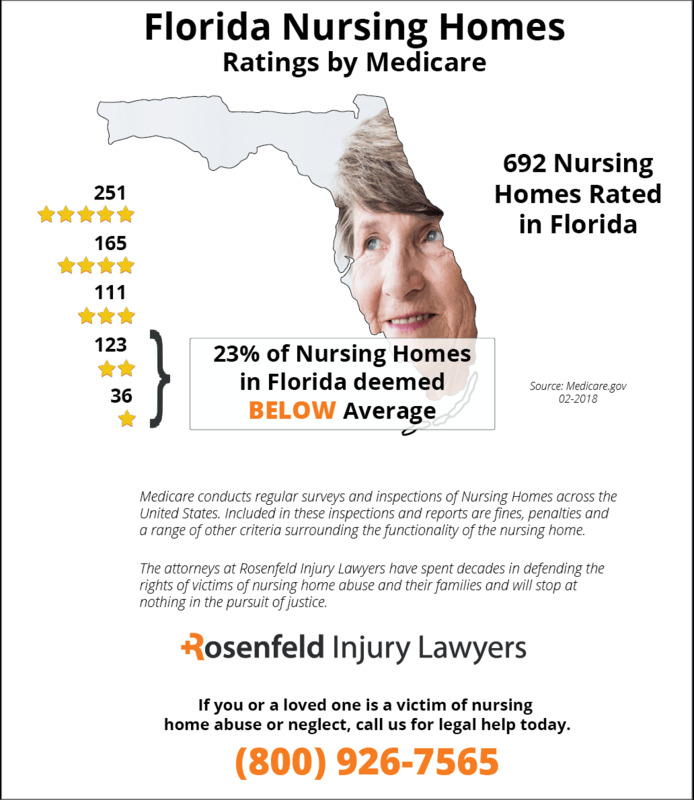 According to data maintained by Medicare, there are 692 nursing homes rated in Florida regularly monitor through inspections, investigations and surveys. Of these facilities, 159 (23%) of the Florida nursing homes were deemed below average compared to national statistics after investigators identified serious deficiencies and violations. If your loved one was injured, abused, neglected, or died prematurely while residing in a Florida nursing facility, we encourage you to contact the Florida nursing home abuse & neglect attorneys at Nursing Home Law Center to discuss your claim for compensation during a free case evaluation to recover your damages. It is clear that until anything is done to improve these disturbing conditions in nursing home facilities, nursing home residents have legal grounds to pursue claims against nursing homes for their injuries. If your loved one has suffered from injuries in nursing homes, then you should get in touch with Florida nursing home abuse lawyers today. Florida nursing home abuse lawyers will aggressively conduct their own investigation of a nursing home facility and hold powerful individuals in these facilities accountable for their disturbing and neglectful actions. If staff workers or family members notice that a loved one is suffering from these injuries, then they should file a report with the appropriate authority and get in touch with nursing home abuse lawyers. Florida maintains strict laws in regards to the rights of nursing home residents and standards that nursing homes must meet. The law governing standards of nursing homes in Florida can be found in Chapter 59A-4. For example, every nursing home must appoint a full-time employee to ensure the confidentiality and maintenance of patient records. If medical records are left out, then the confidentiality of a resident’s condition may be compromised. In addition, Florida laws have been designed to protect against the exploitation of elderly and disabled individuals. Abuse occurs when a worker intentionally inflicts injury or willfully neglects a resident. In Florida, a worker who commits this abuse will be liable for a third-degree felony that is punishable by s.775.082, s.775.083 or s.775.084. 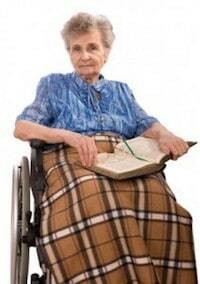 Nursing home residents are also entitled to certain rights under Florida law. These rights include the right to private communications, right to be free from restraint and coercion, right to manage his or her own financial affairs, right to be informed of medical treatments, right to receive adequate medical treatment, right to be treated with dignity and the right to be free from physical abuse. If you suspect that the rights of a loved one have been violated under Florida law, then you should speak with a nursing home abuse lawyer who can help you today. In Florida, the Long-Term Care Ombudsman Office handles reports of abuse and fraud. Family members should make all reports of abuse to this office. Once a report is filed with the Ombudsman Office, then the office will investigate a complaint. Emergency protective services may be necessary to remove your loved one from the nursing home facility. Florida currently maintains a statewide system of 17 district councils with volunteer ombudsmen that can be contacted at any time. Florida nursing home abuse lawyers are here to aggressively protect your loved one by fighting for the compensation that your loved one deserves. Feel free to schedule an initial consultation with one of our lawyers today. In recent years, there has been a significant increase in the demand for nursing home beds throughout Florida. A survey conducted by the nonprofit Florida Center for Nursing shows that by 2015 more than 11,000 additional registered nurses will be needed in the state to accommodate the health requirements of the aging population. However, the demand for highly trained nurses is already not being met, which places many nursing home residents at risk of harm while under the care of understaffed and overworked medical professionals. 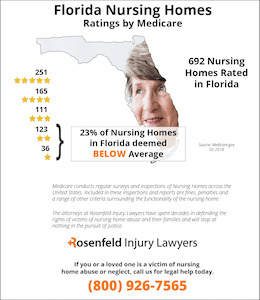 The Florida bed sore lawyers at Nursing Home Law Center LLC are committed to holding negligent nursing homes and hospitals accountable for their negligent care. If your loved one developed a pressure sore during an admission to a Florida medical facility, we invite you to contact our office for a free review of your legal options. There are strict time constraints for pursuing a case, so we urge you to take action today and begin the legal process of determining who is responsible for the development of a pressure ulcer. Often times, families are separated from their aging loved ones who have retired in the southern state. When the time arises, families are often forced to place them in a nursing home to assist them with their health and daily activities. It is the family’s belief that the nursing facility provides quality medical care and basic necessities to every patient. Unfortunately, nursing homes filled to capacity often do not have enough nurses and nurses’ aides, or the staff is undertrained to handle common health issues in the facility. As a result, many patients become the victims of neglect and suffer harm like developing a bedsore acquired in the nursing home. A bedsore (pressure sore; decubitus ulcer; pressure ulcer) is an injury to the patient’s skin and underlying tissue. It begins to develop when pressure is applied to bony areas that touch the bed, chair or other body part. When the elderly patient is bedridden or unable to readjust their body position, even mild pressure on an ankle, heal, buttocks, sacrum, spine, shoulder blades, shoulder, back of the head or other area can quickly develop a sore. Properly managed nursing homes create and implement monitoring protocols to ensure every patient is kept free from developing a bedsore. The protocol usually involves an assessment of the patient’s skin at the beginning of every nursing shift change. Any noticeable sign of a developing sore is recorded in the patient’s chart to alert the doctor to begin steps to heal the wound. Additional protocols require that the patient be turned at least one time every two hours. If the bedsore is allowed to advance from a reddened inflamed sore in the early stages, it can quickly develop into a serious wound where fat, muscle, tendons and bone are exposed. At this advanced age, the elderly patient can easily acquire a blood infection (sepsis) or bone infection (osteomyelitis). In advancing stages, the pressure sore can be very difficult to treat and will often cause permanent damage or lead to death. Many families live too far away from the nursing home to visit on a regular basis and are not always aware when their loved one develops a pressure sore. When the family is notified of a changing health condition, the sore is often in its advancing stages where it is already caused significant harm or death. Because bedsores are very easy to avoid when trained staff follow proper protocols, these sores are usually an indicator of negligence at the facility. Because of that, many families hire an experienced Florida bed sore lawyer to take action to stop the negligence and mistreatment. Below is a list of reputable professionals who can assist the family in providing a variety of legal options, including bringing in highly skilled medical professionals specialized in treating difficult pressure ulcer cases. If you suspect your loved one has been suffering a bedsore while a resident in a nursing facility in Florida, it is essential to hire a skilled Florida bed sore attorney today. Nursing Home Law Center LLC can take steps to stop the negligence and hold all parties responsible for the injury accountable for their action. Our Florida nursing home negligence lawyers offer an initial free no obligation consultation to discuss the merits of your case. They can provide numerous legal options to assist the family in seeking financial compensation to cover the cost of proper medical care. Their efforts can ensure your loved one is being treated with the dignity and respect they deserve. For a thorough discussion of a bed sore settlements and case valuation look here.